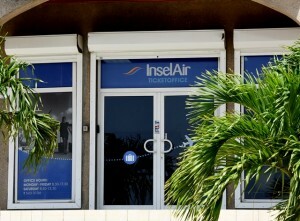 PHILIPSBURG - The trial of two former InselAir employees accused of defrauding airline InselAir of approximately US $100,000 will resume June 22, the Judge in the Court of First Instance decided Wednesday. InselAir St. Maarten’s Station Manager A.A.H. (51) and Sales Agent S.B.B. (28) are accused of defrauding the airline of approximately US $100,000 in mid-2016. As the two are contesting the alleged amounts, which they claim were in fact about one-third lower, the Judge decided during a previous hearing held April 11 to suspend the trial to add bank statements to the case file. Wednesday’s hearing met the same fate as lawyer Safira Ibrahim is among the pro-bono lawyers currently on strike to urge government to pay out their due fees. Besides, her clients were both not properly summoned for Wednesday’s hearing, which left the Judge no other option but to postpone the hearing for another 16 days. The funds were discovered to be missing after an audit by an external team of investigators mid-August 2016, after reports of missing funds had surfaced at InselAir’s main office in Curaçao several months before. The airline sent the manager on immediate leave of absence, while the company terminated the sales agent’s contract. Talks started for a settlement between parties, but management decided to go another route later and filed an official complaint with the police. Meanwhile, A.A.H. had travelled to the Dominican Republic. He was arrested May 16, 2017, on his return to St. Maarten, and was taken into custody for some time. Both defendants are suspected of embezzlement and money-laundering. Both confessed to the Judge they had taken money from their employer as they had felt they were underpaid. According to InselAir, which filed claims against its two former employees, A.A.H. defrauded them of $88,450 and S.B.B. of almost $30,000. The money was obtained from ticket sales. Part of the revenues were not deposited in the company’s bank account but allegedly disappeared into the manager’s and sales agent’s pockets. Based on information provided by InselAir, the Court could not objectively establish the exact extent of the embezzlement. To be able to check the airline’s calculations, bank statements are required from the account on which the two staff members had to deposit the cash payments they had received. This would allow the Court to determine the difference between the booked sales figures and the actual amount deposited in the account, and thus also the exact misappropriated amounts. The Court requested InselAir to provide the required bank statements for these to be analysed by the Police Force of St. Maarten’s Financial Investigation Department.